Here is another edging from the same book. I have shown the picture of the pattern first this time and you can compare it to the one I made. I followed the pattern more closely with this one. It was much easier. The last two motifs I did in reverse order and I like the way the thread connected at the top better. It seems to lay much flater. I have one more sample I am going to work up to see how I like it. This sample was done with Cebelia Size 20 thread. Looks very nice. I like the red. I like it!!! Which book is that one? Looks like have plenty of pretty patterns. 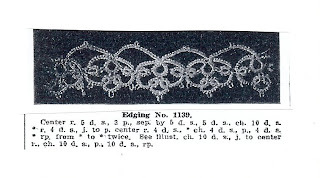 This pattern is from Old and New Designs in Tatting by Sophie T. LaCrois, Book No. 11. edging number 1139. Ooh! I really like this! The red would be beautiful as a hanky edging!